Aid stations at the ready. Andreas Raelert is in 11th place, directly behind Albert. He's pacing himself well and has maintained his gap to 10th place. Some #IMFrankfurt fast facts: Last year's female winner was Corrine Abraham (8:52:40), Kienle is our defending champ with his 2014 7:55:14 (course record) and 4:12:14 bike split. 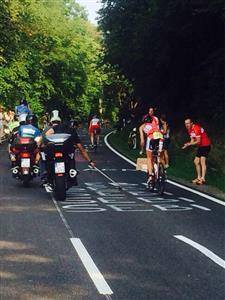 Frodeno is opening up quite the gap over his chasers. 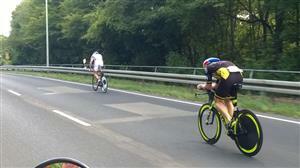 He's now 3:00 ahead of Kienle and Boecherer in 2nd and 3rd, but the riders aren't even out on the 2nd loop yet. A lot can happen out there still! Freddie Van Lierde powering away in third. 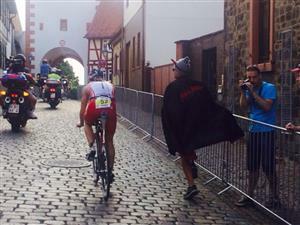 Fact Fact from #IMFrankfurt: Frodendo had 3 flats last year in his debut here at the IRONMAN distance. He's now onto his second lap of the course.